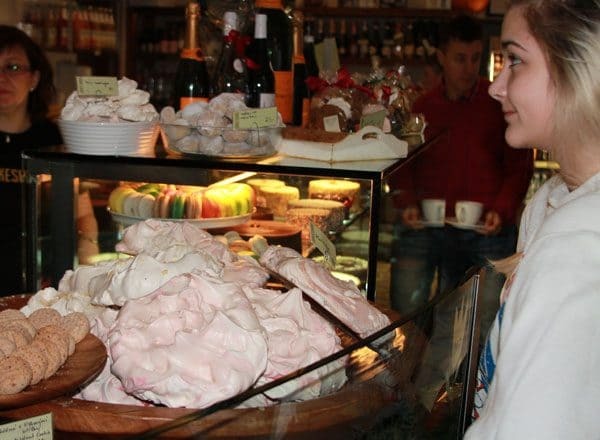 Chocolate Swirled Meringues and Salzburg, Austria - Chocolate Chocolate and More! 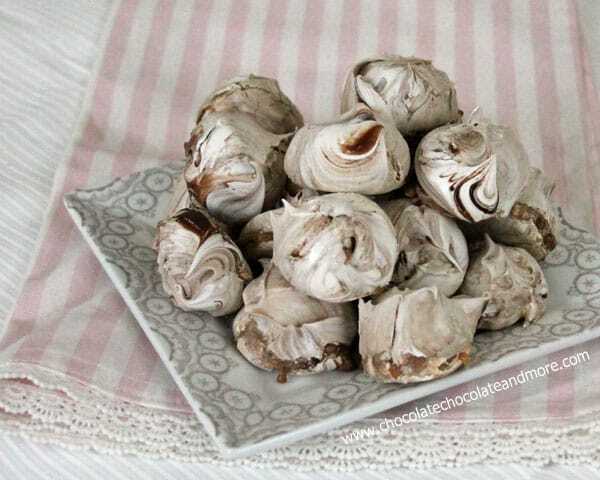 Chocolate Swirled Meringues-whipped egg whites, a little sugar, swirled in chocolate then slow baked into a crispy cookie. 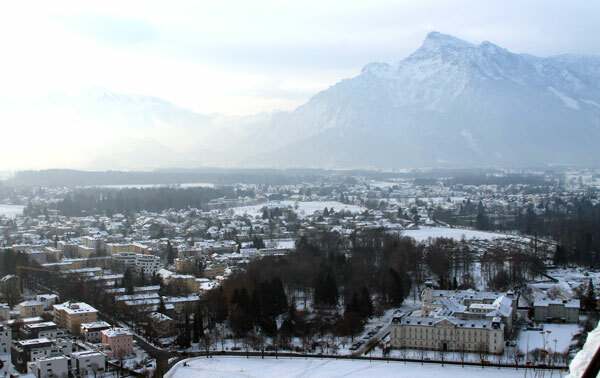 After visiting Prague, we headed over to Salzburg, Austria. It took us a taxi, a bus and then train to get there. Thank goodness my sister is a regular traveler. I would still be sitting on a curb in Prague trying to figure it all out. 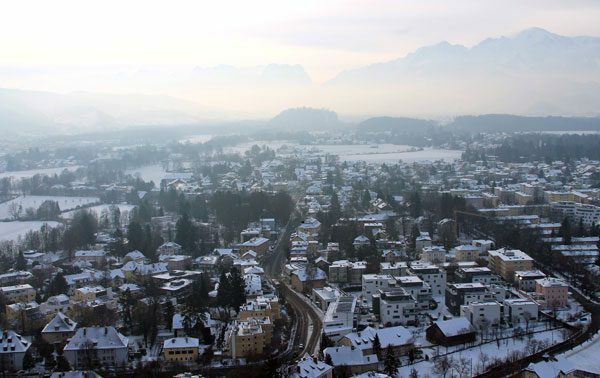 Salzburg is the home of Mozart and the Sound of Music. 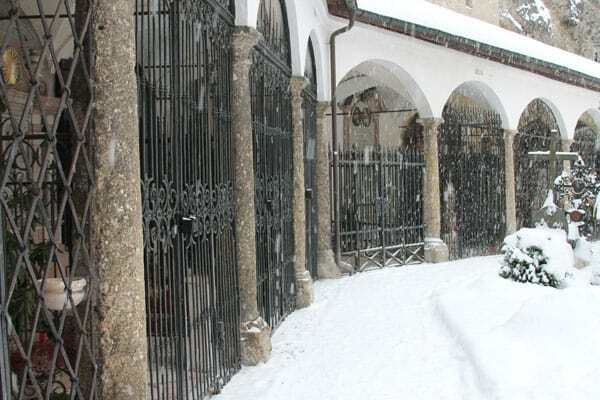 Also noted for their amazing churches and the Fortress Hohensalzburg. Seriously, they are the size of my niece’s head. I really should have asked what they baked with all the egg yolks. They also had pretty smaller ones. My sister picked up a bag of assorted cookies, and a brownie that was to die for! It had orange and cranberry in it. I will be playing around with brownies soon! Their meringues taste just like ours. 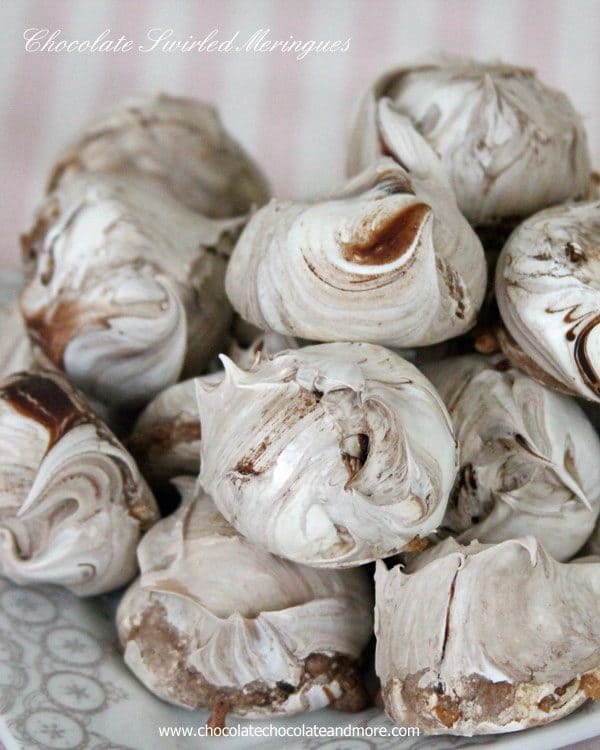 These Chocolate Swirled Meringues happened because I really want to share my trip with you. And because about a month ago, I Am Baker pointed out to me Manuela of Passion for Baking on Instagram. Her photography and her treats make you want to reach through the screen and eat one of everything. I spied her Christmas Chocolate Meringue Clouds. I had an epiphany. A light bulb moment. A why didn’t I ever think of that, moment. Instead of using a pastry bag and tip, trying to make my meringues all fancy, use a Cookie Scoop! Each cookie ends up the same size and they have cute little peaks at different spots, giving each cookie it’s own personality. And of course there is the whole chocolate swirl deal. Manuela’s recipe involved cooking the egg whites first, to blend them with the sugar. Too much work for me, so I used my stand by recipe for Meringues and swirled in the chocolate. I almost swirled too much but that’s ok.
Place chocolate in a microwave safe dish and melt on 50% power for 60 seconds. Continue to heat at 50% power in 15 second intervals until chocolate is about half melted. 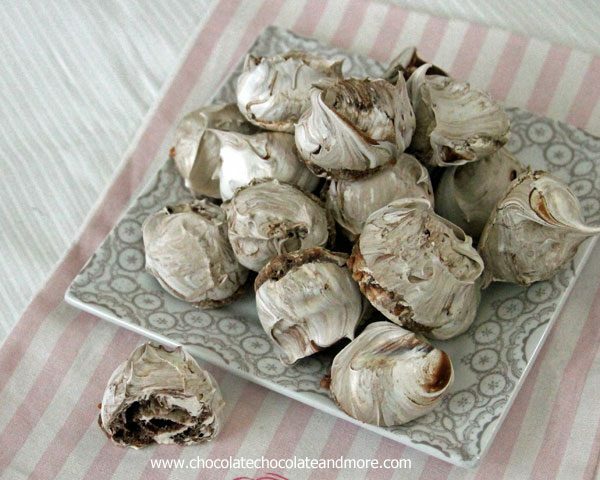 Remove from microwave and stir until smooth and completely melted. If needed heat for additional time. Let chocolate cool. In a mixing bowl, with the whisk attachment, start beating the egg whites and cream of tartar on medium to medium high speed. Once soft peaks begin to form, slowly add in sugar and vanilla extract, while continuing to beat. Continue to beat until stiff peaks form and your egg whites are glossy. Drizzle about half of your cooled melted chocolate over egg whites and then fold in one time. Drizzle remaining chocolate over egg whites and fold 2 more times. Do not over fold, you want the chocolate streaks to run through the white. Using a medium or large cookie scoop, place cookies 2 inches apart on a parchment lined baking sheet. place in a preheated 200 degree oven and bake for 90 minutes, turn tray one time during baking. Turn oven off and let cookies sit in oven for 6-8 hours or overnight. Next time I have extra egg whites, I need to make a Huge cookie, just so I can say I did. Although I believe that would be called a Pavlova, and usually there’s fruit involved but I can deal with that. 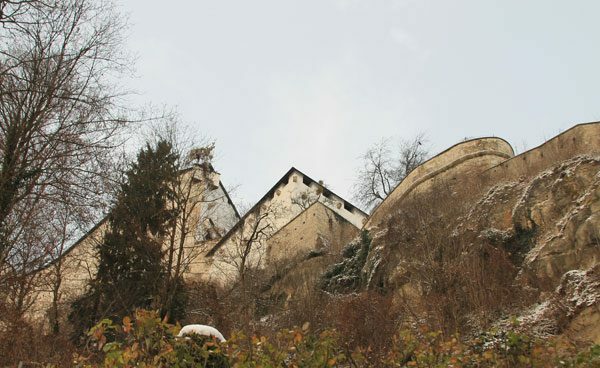 We visited the Fortress Hohensalzburg (Hohensalzburg Castle) first. Think of every romance novel you’ve ever read set in medieval times. If you don’t read romance novels, just pretend you do. It’s one of the largest castles in Europe. 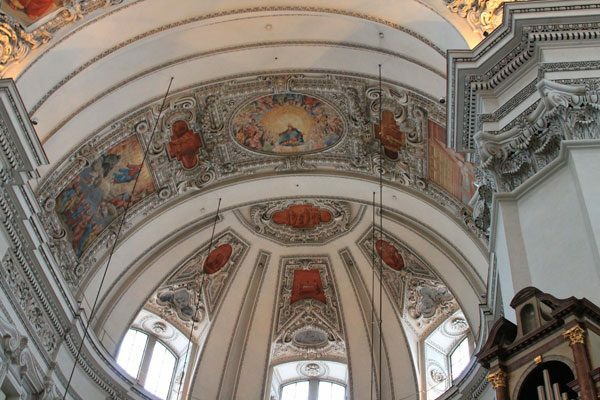 The Churches in Salzburg (all of Europe really) have been around for hundreds of years and are filled with history as well as beautiful mosaics and sculptures. The ceiling in the dome of the Salzburg Cathedral. I really just wanted to lay on the floor and stare up for hours. In addition to the mosaics, the statuary in these churches along with the embellishments everywhere have withstood time. 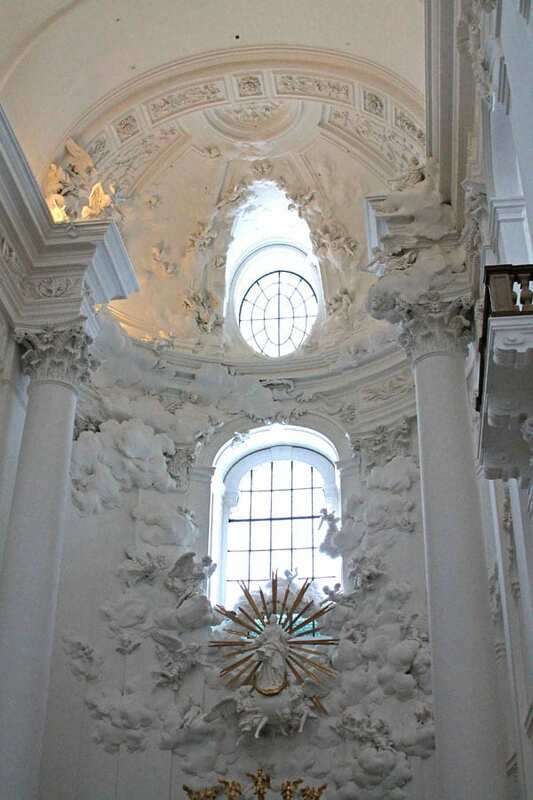 This is the front Alter in Kollegienkirche Church, Salzburg, Austria, known as the all white church. Starkly white with just a few gold embellishments, you feel a sense of purity standing in this church. 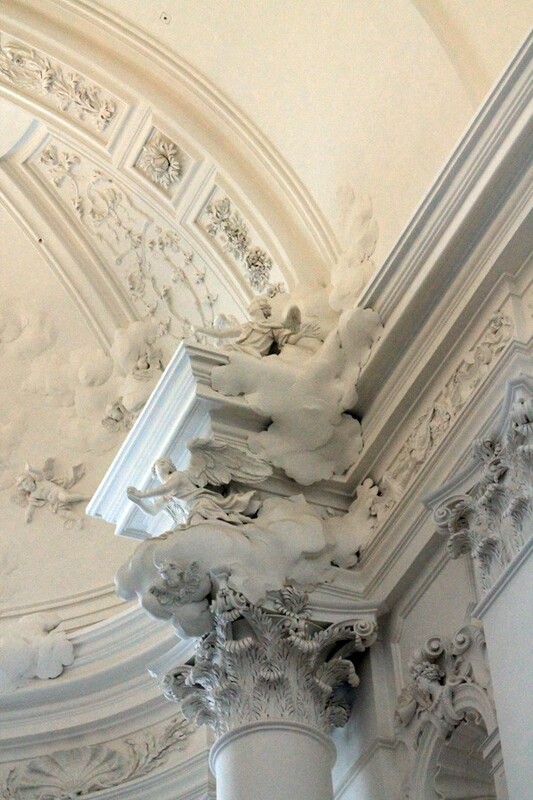 Angels are everywhere in the ceiling decor and on the columns of the alter. 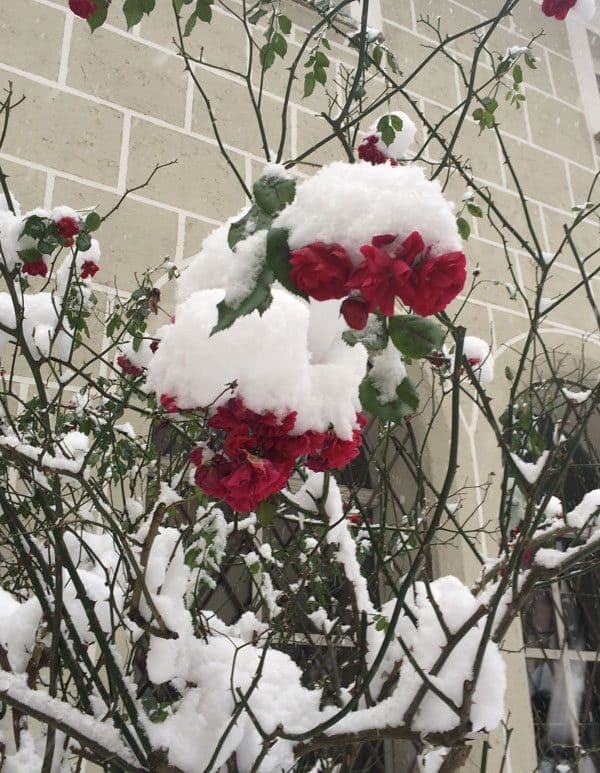 Even covered in snow, the beauty still pops out. I can’t wait to go back again, in the spring or summer and visit all the set locations as well as the Ice Caves. Wonderful photos of Salzburg, Joan. 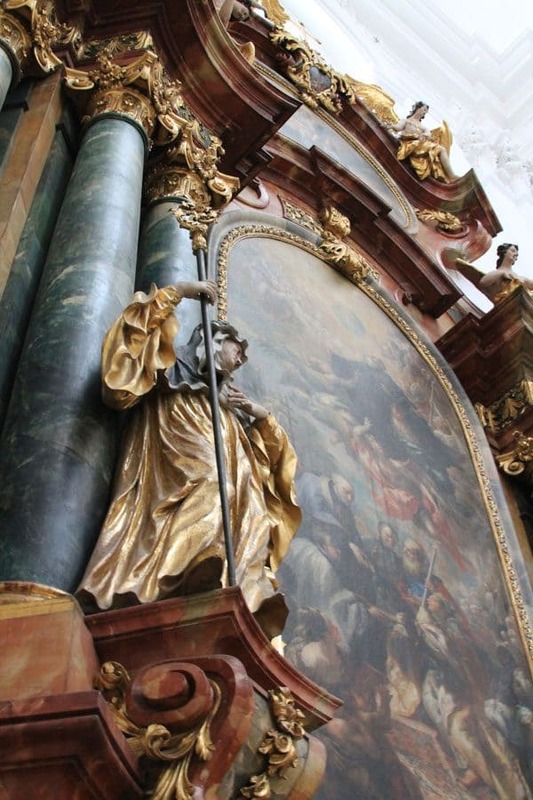 Love the close ups of the architectural details in the churches and how you blended a recipe post with your travels. I confess, all I know about Salzburg, I learned from PBS and Rick Steve’s. And my wife makes me watch those. But it does look fun, I might even be tempted to sing on the mountain top. 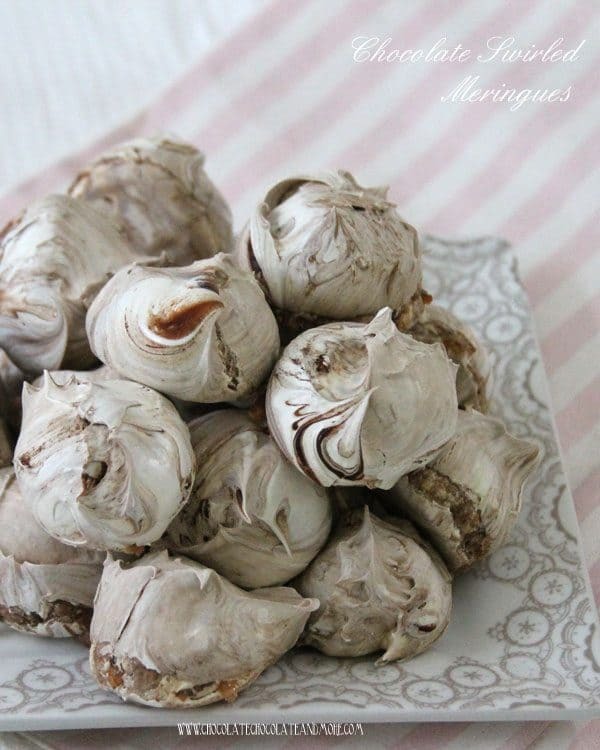 These meringues looks seriously yummy. Haha Tom, if you ever get to go to Salzburg, they have a tour that takes you to all the locations for the filming of the Sound of Music and you can sing on that mountain top! Maribeth, you need to add Salzburg to your bucket list. There is so much history and music about Mozart, from his childhood to his death. I’m not a big museum person but I found the way they presented the museums in Salzburg, I was captivated to learn more. Thank you so much for sharing your photo’s from your vacation. I have been enjoying all of the recipes and at the same time being able to see how you found them. Such gorgeous pictures – and a fabulous trip! But these meringues – heavenly!!! Could eat a few – or several right now! Thanks Robyn, I can’t wait to go back! Yes the temperature is correct. It’s 200 degrees fahrenheit. The key is to leave them in the oven, with the door kept shut for several hours, preferably, overnight. So they can slowly dry out without developing a burnt taste. So just to clarify: the recipe is calling for granulated sugar NOT powdered sugar (confectioner sugar)? Your pictures are so pretty! LOVE!!! Isn’t Europe just marvelous! I am actually sitting in Milan right now and definitely not wanting to come home on Saturday! I have never visited Prague or Austria so I am glad you shared your trip with us! Meringues are my ultimate favorite thing to make! Yours looks delicious! That looks like such an amazing vacation, and I like the meringue recipe! Thanks Lauren! I can’t wait to go back! Thank you for reminding me how much I enjoyed Salzburg! I love looking at your recipes and keep bookmarking them to try. Thanks for sharing! and also-the cookie scoop idea for the meringues is so smart and the swirl is like…so yum. Love em!